1. 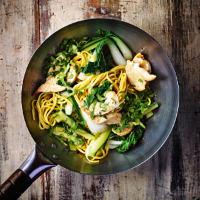 Heat oil in a frying pan or wok and stir-fry the chicken and chilli for 5 minutes or until chicken is cooked through with no pink meat. 2. Meanwhile, cook noodles in boiling water for 4-5 minutes until tender, drain. 3. Add the cucumber and pak choi and fry for 3 minutes, covered. Stir in the kicap manis, noodles and 4 tbsp water and cook for 1 minute. Sprinkle with coriander and serve.